Thoughts Arise: Is "Flat" Science "Real" Science? Is "Flat" Science "Real" Science? In his informative - and entertaining - talk at the May meeting of the Atlanta Science Tavern, entitled Artificial evolution: a guide for hobbyists, Ichiro Matsumura, Associate Professor of Biochemistry at Emory University School of Medicine, began by reviewing the historical patterns of general scientific progress and proceeded to focus on his research efforts which attempt to explain how complex biochemical pathways of cells originate and adapt. He concluded his presentation by discussing the emerging community of unorthodox "scientists", well outside the academic and corporate mainstream, who are pursuing experiments similar to his own, but in kitchens and basements, far removed from the luster - and expense - of state-of-the-art university laboratories. So, in some ways Ichiro's talk was a presentation of his recent discoveries about how complex cellular processes evolve, but in other ways it was a call for science to return, at least in part, to its table-top roots. Apparently, these days an amateur with a few hundred dollars and kitchen counter space to spare can purchase the materials and equipment necessary and, in short order, alter the genetic makeup of commonly available bacteria. For Ichiro this represents a "flattening" of the scientific enterprise, a welcome alternative to the "hierarchical" restrictions of conventional science that require not only professional credentials, but large sums of money, often acquired only after running the exhausting grant application gauntlet of established funding agencies. I share Ichiro's excitement for the opportunity that these low-cost-of-entry home laboratories have created for more people to become involved in science-oriented hobbies. Like him, I think that, within the constraints demanded by public safety, this kind of experimentation should be encouraged. Also, like Ichiro, I believe that the spread of these do-it-yourself labs is inevitable. With increasing economies of scale, the costs will only drop and, with Internet resources, the essential technical information will only become more available. The genie is out of the bottle, as they say. Where I believe I disagree with Ichiro has to do with whether this new field of DIY genetic engineering, "flat" as it is, constitutes "real" science and whether the hierarchy problem of modern science is, in some fundamental way, avoidable. Now, although I am not prepared here to define science in any comprehensive sense, I do think that a case can be made that hobbyism, for lack of a better word, is not science. Another way of stating my position is to say, "a laboratory does not a scientist make." By making this distinction I do not intend to demean hobbyists or, conversely, to put scientists on a pedestal, but to point out what I believe is a critical feature of the scientific enterprise, and that is the obligation to communicate the details and results of one's investigations so that they can be subjected to public scrutiny and, where appropriate, correction, and so that they may also serve as a basis for further investigation. Consider, for historical comparison, the too-much-maligned alchemists of the middle-ages. They were hobbyists extraordinaire and, in a very real sense the proto-scientists who laid the groundwork for the science of experimental chemistry that was to follow. I doubt that they lacked the brains or the temperament to be real scientists. What I do think that they lacked, in particular, were a reliable postal system and other ready means to publicize the results of their laboratory work. I imagine that in the 17th century the number of reports and opinions about scientific matters - even concerning a relatively specialized area of research - far exceeded what any individual could consistently review. In a world awash in scientific findings how does one begin to decide whom to trust without resorting to expert opinion? Although our democratic inclinations tend to imbue us with a reflexive disdain for "elites", we have no choice other than to rely on people whose experience and judgment are widely recognized. Once experts are designated, either, in the 17th century, as celebrated fellows of the Royal Society, or, today, as the anonymous peers who enact the review process characteristic of the contemporary funding and publication of science, a hierarchy is created. Of course such stratification of scientific authority is not without its perils. It brings to mind the age-old conundrum, captured by the Roman poet Juvenal with the query, "who will guard the guards themselves?" A delicate - and unavoidable - balance must be maintained between what, on one extreme, would result in lifeless orthodoxy and, on the other, in intellectual chaos. This is, in some sense, the sociological challenge of modern science, to effectively filter the vast amount of new information that is generated while not censoring well-considered novel contributions that threaten the established order. It's a tough job, but someone's got to do it. So, once again, let's hear it for those folks who are enthusiastically working away in their at-home laboratories modifying bacterial genes. 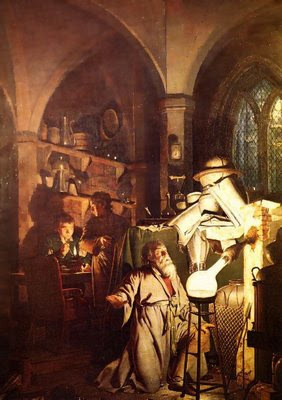 Like the alchemists before them, they are involved in a personal process of discovering fascinating new things about the nature of the world. But, until their private investigations become public ones and they engage in the kind of dialog that leads to the dissemination and review of their discoveries, they will remain hobbyists, not scientists. And, like it or not, when they choose to cross the divide which demands that they publish their findings and subject them to the criticism of their peers, gatekeepers will, of necessity, arise to manage the, otherwise, overwhelming flow of information. The problem of hierarchy will be born anew. There's no way around it. We have just added your latest post "Thoughts Arise: Is" to our Directory of Science . You can check the inclusion of the post here . We are delighted to invite you to submit all your future posts to the directory and get a huge base of visitors to your website. Thanks for your thoughtful commentary. I agree with you that science will always be associated with some amount of hierarchy, but I still believe that the current system is excessively hierarchical. I've seen a lot of great scientists get weeded out of the profession, which leads me to believe that a flatter system would be more innovative. You are a fantastic science writer -- clear, thoughtful, and careful (I noticed you didn't fall for the trap of trying to define `science'). As to the idea of ``flat science'' is not real science, I see examples all the time where the lack of peer review and disdain for `elite' (informed) opinion, lead to unreliable claims and results. One example is the cold fusion community, many of whom don't have strong physics backgrounds, yet are convinced that Pons and Fleishman were right after all (and some do have strong physics backgrounds, and have decided to risk their careers pursuing it). And in my own field of mathematics, if you can call it a science, there is the amateur mathematician. Ever now and then I get a letter from an amateur mathematician claiming to have proved this or that important theorem, and invariably they are wrong or their result is not important. Many of these cases of wasted effort could be avoided if only these amateurs had bothered to get a good education in their subject of research. In the case of amateur physicists, a good solid undergraduate education in physics (I at least have that, and am not a physicist), and an appreciation of the law of conservation of mass-energy should be a minimum requirement; and, in math, some basic requirements are an understanding of how to write proofs, and a basic knowledge of higher algebra and number theory. There is a book I read a year or so ago that is well worth reading, full of many more examples from outside science. It is called ``The cult of the amateur'', by Andrew Keen. I recommend it. Just a couple thoughts. In order to do homemade science, you must, of course, choose a problem that does not require great expense to investigate. I am acquainted with a number of physicists, some for example at undergrad teaching institutions who have done wonderful science by carefully choosing important problems that can be done on a shoestring. They are quite connected to the "hierarchy" through publications etc, which I think they must be in order for their work to undergo the proper scrutiny. You don't need the big funding/resource machine for carefully chosen problems, but science requires the vetting of peers.